Since 1973 Tru Hone has been dedicated to manufacturing, marketing and servicing knife sharpeners of the highest quality in the industry. The HR8 Honer is an important part of our commitment to produce knife sharpening systems that do the job quickly, precisely and economically. It uses two pair of contra-rotating 8 inch (20.3 cm) honing wheels mounted on parallel motor shafts to simultaneously sharpen both bevels of a knife edge. This results in equal bevels and a finely sharpened knife that does not have a burr edge like some knives sharpened on machines which only sharpen one bevel at a time. The HR8 Honer puts a perfect edge on a knife in less than a minute. Simultaneously sharpening both sides of a knife edge greatly reduces the sharpening time and labor cost required for this crucial job. Contrast this with outdated methods that grind one side at a time. The HR8 uses a low motor speed to sharpen knives. This removes only a minimum amount of metal to produce a sharp edge and could add as much as 50% to the life of a knife. High levels of production and yield are critical for a processing plant. 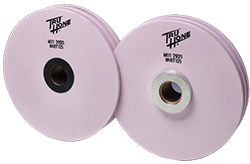 Knives sharpened with the Tru Hone System cut faster and remove more product. Properly sharpened knives may also reduce injuries by decreasing the amount of force required to cut product. 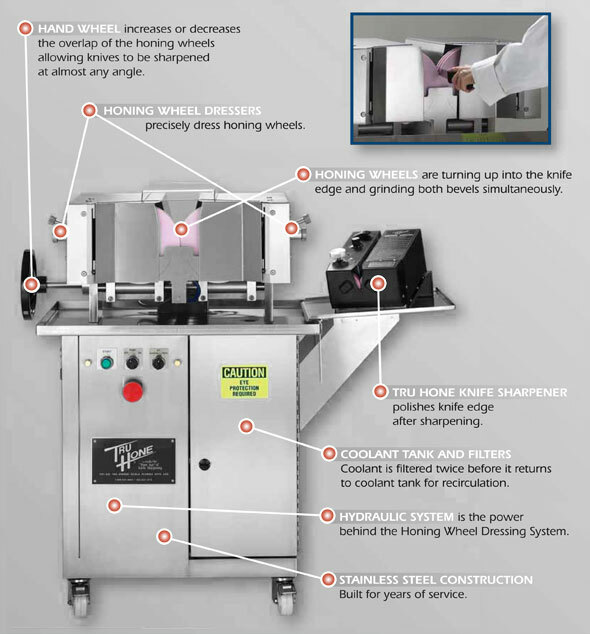 A precision calibrated, semi-automatic dressing system maintains the HR8 honing wheels. By turning the pre-set dial on the diamond advancement mechanism one click, you dress the wheels. Each click indicates an incremental change of 3/1000th of an inch (.0075 cm), removing only a minimal amount of the honing wheels. With such an exact, no-guess dressing system, the HR8 honing wheels last longer and are kept perfectly round. The HR8 is a wet honing system. A mixture of water and coolant additive flow onto the honing wheels to prevent any heat build-up which could damage a knife edge. It also eliminates dust in the work area. The coolant system is self-contained so a water connection is not necessary. A double filter system filters the coolant twice before it returns to the coolant tank for recirculation. The honing wheel overlap on the HR8 Honer is easily increased or decreased, allowing knives to be sharpened at the precise angle needed for a particular cutting operation. The HR8 Honer is built to last for years of service. Two 3/4 horsepower motors with stainless steel 5/8 inch (1.6 cm) shafts, 1 1/4 inch (3.2 cm) wheel collars and stainless steel bearings are each mounted on 1 inch (2.54 cm) thick plates that move in and out together on 1 inch (2.54 cm) stainless steel rods. The stainless steel cabinet, motor covers and components assure durability and sanitation. The HR8's entire electrical system is completely sealed. All electrical switches are located within easy reach for safety. Tru Hone's HR8 Honer has a one year warranty and is backed by a commitment to service that has made Tru Hone a leader in the industry.